This study aims to assess the efficacy of computed tomography (CT)-guided celiac plexus neurolysis (CPN) to relieve pain caused by abdominal malignancy. The management of severe pain in patients with cancer is a challenging matter faced by medical care providers. CPN is an effective method that can alleviate pain caused by abdominal malignancies. It leads to marked decrease in the analgesics daily dose or even not needing it. 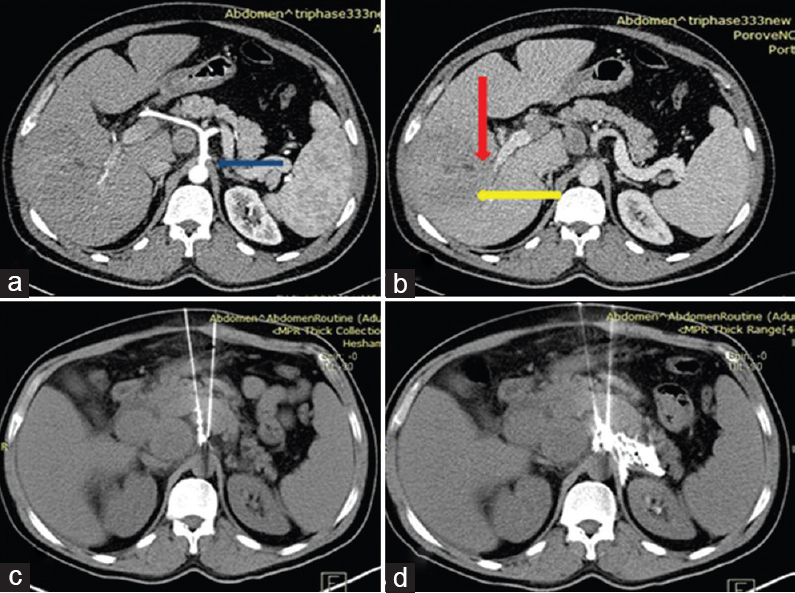 CT-guided CPN was done for 20 (90%) adult patients experiencing abdominal cancer pain using ethanol as a neurolytic agent. To assess the degree of pain relief, the visual analog scale score was used to assess pain immediately, 1 week, 1 month, and 3 months after CPN. Marked decrease of the pain intensity in all the patients was noted. The visual analog scale score at baseline was 9.1 ± 0.85. 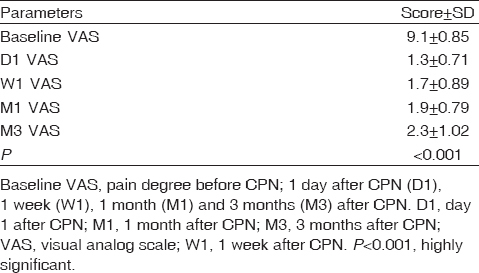 One day after CPN, pain severity decreased to 1.3 ± 0.71; 1 week later, it was mostly maintained at the same level at 1.7 ± 0.89; 1 month after CPN, the pain severity was also maintained at the same level at 1.9 ± 0.79; and 3 months after CPN, pain severity still decreased significantly to 2.3 ± 1.02. The decline in pain severity at its average before and at different sequences after CPN recorded high significant statistical difference (P value less than 0.001). CT-guided CPN is an effective and safe method for relieving severe pain owing to abdominal cancer. Cancer-related pain remains a common problem in oncologic practice and has a major influence on patient's comfort, tolerance of therapies, and probably survival . Timely interventional cancer pain therapies complement conventional pain management by reducing the need for high-dose opioid therapy and the associated toxicity . Abdominal viscera including pancreas, liver, gallbladder, adrenal, kidneys, and the gastrointestinal tract from the level of the gastroesophageal junction to the splenic flexure of the transverse colon are innervated by the celiac plexus. So, pain owing to tumors in these viscera may be relieved through the use of a neurolytic celiac plexus block ,. The celiac plexus is an aggregated network of autonomic sympathetic nerves that is located anterior to the aorta and the crus of the diaphragm at the first lumbar vertebral body level (LV1). The plexus extends for few centimeters in front of the aorta surrounding the celiac trunk and the superior mesenteric artery . The location of the celiac plexus usually varies regarding the bony landmarks [from the twelfth dorsal vertebra (DV12) and the first lumbar vertebra (LV1) to the middle of the second lumbar vertebra (LV2)], but it is more reliably found close to the celiac artery, on average 0.6 cm caudal to the celiac artery on the right and 0.9 cm caudal to the celiac artery on the left ,. Celiac plexus neurolysis (CPN) was first introduced in 1914 by Kappis and colleagues. It was initially performed through a puncture according to the bony landmarks on the body surface. This technique was then obsolete because of the inaccurate puncture localization and blind distribution of the neurolytic agent . After that, there are different approaches developed to improve the accuracy of needle placement, increase efficacy, and decrease the complications. Ways to deliver these agents to the celiac ganglion include surgery, computed tomography (CT)-guided injection, percutaneous ultrasonography, fluoroscopy, or endoscopic ultrasonography-guided (EUS) approaches . CT has superseded other imaging modalities as the preferred technique, with its proved safety . Using multidetector CT guidance, needle placement into the region of the celiac plexus and the location of the needle in relation to the vital anatomic structures is directly visualized . CT also shows the extent of tumor spread and other concurrent causes of abdominal pain such as duodenal obstruction, bone destruction, and muscle invasion . Moreover, one of the major aspects of CT is its ability to follow the spread of the neurolytic agent and to detect its leakage into the peritoneal cavity . CT-guided CPN is a relatively safe procedure; most of the complications reported are minor like transient diarrhea, local irritant pain from neurolytic agent, or hypotension, whereas major complications like paraplegia, chemical peritonitis, or bleeding are extremely rare especially when the procedure is performed with skilled hands ,. This study aimed to appraise the incremental value of CT-guided CPN as an effective method for palliative management of the intractable pain owing to abdominal malignancy either primary or secondary. This prospective study was carried out on 20 adult patients having abdominal pain owing to abdominal cancer during the period from March 2016 to May 2017 in National Liver Institute, Menoufia University. The study protocol was approved by the Medical Ethical Committee of Faculty of Medicine, Menoufia University. After an informed consent was taken from each patient included in the study, all the patients underwent CT-guided CPN with unilateral or bilateral paramedian needle entry using anterior approach technique. The inclusion criteria were abdominal pain due to abdominal cancer, pain not controlled by analgesics according to WHO step ladder, and patients having adverse effects of analgesic drugs. The exclusion criteria were patient's refusal of the procedure, patients with coagulopathy, and patients with marked ascites. All the patients included were subjected to detailed medical history, general examination, and other investigations such as abdominal ultrasound, CT abdomen, and coagulation profile. The patients were asked to stop analgesics over the night before the procedure, fast for 8 h, and were informed about the complications and hospital stay time (usually a night before the procedure for preparation and 4 h after under observation). Multiple syringes (3, 5, and 10 ml), sterile dressing, betadine and alcohol for sterilization, multislice wide-bore gantry SOMATOM Definition Flash CT Scanners 20 and 128 slices (Siemens Healthineers Global, Erlangen, Germany), lidocaine 2%, ethyl alcohol 15–25 ml 90%, chiba needle 20 or 22 G with length 20 cm, intravenous cannula (18 G), intravenous, fluids and resuscitation drugs (ephedrine, atropine) were used during the procedure. All the patients included in this study were positioned in supine position, and anterior approach was used. All patients fasted for 8 h before the procedure. Intravenous cannula size 18 G was inserted, and standard monitors were used, including automatic cuff blood pressure, pulse oximeter, ECG, and baseline values, for mean arterial blood pressure, heart rate, and oxygen saturation measurements. A control axial scanning of the abdomen was taken to localize the region of interest which covers the celiac plexus location and the course of the needle to the celiac plexus. After sterilization of the skin, the local cutaneous and subcutaneous anesthetic (lidocaine 2%) was injected. Then a 20-cm long 20-G or 22-G Chiba needle was introduced in paramedian plane. Using serial localized CT scans focused on the region of interest, the needle was advanced into the right lateral or the left lateral area to the celiac trunk origin. Once the tip of the needle confirmed to be correctly positioned, suction was applied to confirm that the needle tip was not inside a blood vessel, then a 'prognostic block' was performed by injection of a local anesthetic (12 ml of lidocaine 2%) mixed with 2 ml of nonionic contrast material (Ultravist; Bayer HealthCare Pharmaceuticals Inc., Wayne, Germany) to show the distribution of the lidocaine under the CT images. Injection of local anesthetic should always precede that of ethanol to reduce the pain from ganglion neurolysis and also for enforcement of a diagnostic celiac plexus block. After 5–10 min if the injection successfully relieved pain (successful block), 15–20 ml of 90% ethanol mixed with 3-ml contrast was used to show the distribution of the ethanol. Before the needle was removed, 3 ml of lidocaine 2% was injected to relieve the irritation caused by ethanol. Immediately after needle withdrawal, serial CT scans were obtained to cover the area from the upper border of the 12th thoracic to the lower border of the first lumbar vertebrae to visualize the spread of the neurolytic solution. The patients had to stay in the hospital for 4 h under observation. Patients were evaluated using the visual analog scale (VAS) score for assessment of the degree of pain relief immediately after injection and 1 week, 1 month, and 3 months after neurolysis. Moreover, analgesic requirements and complications were documented. A decrease in the VAS score to 50% or more of the baseline value was considered significant. Complications management: postural hypotension was managed by intravenous fluids, whereas transient diarrhea was managed by intravenous fluids and diosmectite sachets per 8 h.
Statistical analysis was done by IBM personal computer (SPSS Inc., Chicago, Illinois, USA) software package version 18.0. Two types of statistics were done: descriptive statistics, for example, percentage, mean, SD, and range, and analytic statistics. P value of less than 0.05 was considered statistically significant. CT-guided CPN was carried out for 20 adult patients. The technique was successfully performed in 20 (100%) patients, of whom 14 (70%) were males and six (30%) were females, with mean age of 50.4 ± 4.83 years. Abdominal pain in the 20 patients was owing to infiltrative or metastatic hepatocellular carcinoma in 10 (50%) patients [Figure 1], pancreatic cancer in six (30%) patients, lymphoma in two (10%) patients, gastric cancer in one (5%) patient, and metastatic breast cancer one (5%) patient [Figure 2]. 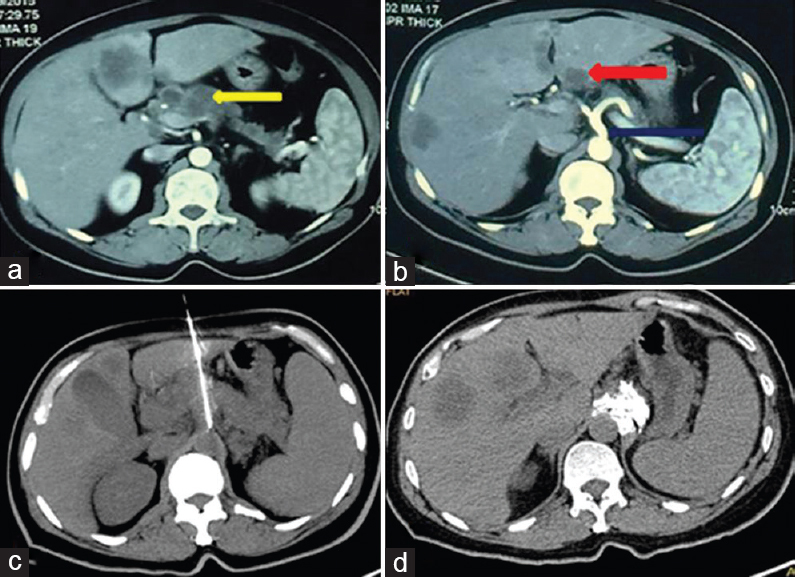 Figure 1: A 42-year-old patient with hepatocellular carcinoma invading the right portal vein undergoing bilateral celiac plexus neurolysis (CPN) procedure. (a, b) Axial computed tomography images show the celiac artery origin in arterial phase (blue arrow), the hepatic focal lesion (yellow arrow), and the right portal vein invasion in portal phase (red arrow). (c, d) Axial computed tomography images of bilateral CPN procedure show the two chiba needles at both celiac plexuses before ethanol injection (c) and after (d). Before CPN, pain degree	by	visual	analog	scale	score	was:	10/10. Then	after	CPN,	it	became	immediately	2/10,	1	week	after	CPN	1/10,	1	month	after	CPN	1/10,	and	3	months	later	1/10. Figure 2: A 52-year-old patient with metastatic breast cancer to the liver and paraortic lymph nodes undergoing unilateral paramedian celiac plexus neurolysis (CPN) procedure. (a, b) Axial computed tomography images show nodal metastasis (yellow arrow), liver deposits (red arrow), and celiac trunk (blue arrow). (c, d) Axial computed tomography images of unilateral CPN procedure show the course of the needle with its tip at the left celiac plexus (c), whereas (d) shows the distribution of ethanol after needle removal. Before CPN, pain degree by visual analog	scale	score	was	9/10. Then	immediately	after	CPN,	it	was	2/10;	1	week	after	CPN	was	1/10;	1	month	after	CPN	was	2/10;	and	3	months	later	was	2/10. [Table 1] and [Figure 3]. Figure 3: Illustrative curve demonstrating changes of visual analog scale score before and after celiac plexus neurolysis (immediately, 1 day, 1 week, and 3 months). According to analgesic drug consumption, after CPN, analgesic drug intake decreased significantly for a period of 3 months after CPN. After 1 week, all patients on opioids stopped them and three (15%) patients continued on NSAIDS. After 1 month, all patients stopped opioids and five (25%) patients continued on NSAIDS, whereas after 3 months, eight (40%) patients continued on NSAIDS and two (10%) patients only took opioids again but with lesser doses than the pre-CPN doses [Table 2]. Regarding the site of needle insertion, right celiac ganglion needle insertion and neurolysis was done in 13 (65%) patients, left celiac ganglion neurolysis was done in five (25%) patients [Figure 2], and bilateral needle insertion and ganglion neurolysis was done in two (10%) patients [Figure 1]. No major complications occurred; however, local irritant pain occurred in 12 (60%) patients, hypotension occurred post-CPN in three (15%) patients, who all responded to intravenous fluid therapy, whereas diarrhea occurred in 15 (75%) patients after CPN, and all responded to intravenous fluid therapy and diosmectite sachets [Table 3]. Treatment of pain in patients with advanced upper abdominal cancer is one of the most important challenges of palliative medical care. Although opioids effectively relieve pain, they are associated with many different adverse effects that can result in a great decrease in quality of life and may also compromise the immune function ,. Since it was first described in 1914 by Kappis , CPN has been performed as a technique that can potentially improve pain control in pancreatic cancer and preventing further increase of opioid consumption. However, many further studies described it as an interventional technique used for the treatment of abdominovisceral pain . Methods to administer neurolytic agents to the celiac ganglion include surgery, fluoroscopy, CT imaging, percutaneous ultrasound, and EUS . Ultrasound-guided technique is limited by poor visualization of thin needles. However, the movements of the tissues while advancing the needle provides experienced practitioners with reliable information on the needle position, whereas the use of EUS requires special equipment and formal training in gastroenterology ,. Although the use of CT carries radiological hazards, time consumption, and no real-time imaging, it provides a high technical success rate and very accurate anatomical guidance . In this study, we used CT-guided technique. Several studies have largely demonstrated the use of CT as a guiding tool for CPN. This study by Kambadakone et al. is one of these studies that used CT as a guiding tool to perform CPN and mentioned in the conclusion that the CPN is a safe and effective tool for palliative pain management, with a very low rate of complications. Moreover, the use of CT guidance is invaluable to ensure good results. In addition, a study by Souguir et al. that performed the CT-guided CPN technique reported similar conclusion. This study was performed through the anterior approach with the patient lying in the supine position, which we founded to be a very convenient and comfortable position for the patients. In comparison with other studies that performed CPN in anterior and posterior approaches, Souguir et al. performed CT-guided anterior approach CPN and mentioned that it was a comfortable position for terminally ill patients. Mohamed et al. have stated that they used the anterior approach to perform CPN as it is easier, safe, and more comfortable than the posterior approach especially in advanced disease. Moreover, the anterior approach makes the needle not impinge on either periosteum, nerve roots, or pass through the paravertebral muscles, with less risk of accidental neurologic injury. For approaches and ways used to place the needle either single unilateral or bilateral paramedian on both sides of celiac trunk, the choice between the single or bilateral methods is still difficult, counting on the personal skills and the experience of every operator . In our study, we used a single unilateral approach in 90% of patients, whereas bilateral approach was done in 10% of patient as pain was not relieved by the single approach. We found the approach to be easy with great pain relief in all patients with no major complications happened. Some studies , preferred single median puncture, and they used the single puncture method to reduce the patients' distress and decrease the amount of the used neurolytic agent, with avoidance of the risk of puncturing the aorta. However, others , supported the bilateral paramedian needle entry technique, despite its more adverse events, owing to greater needle movement. They thought that the technique of single puncture was not adequately exposing the celiac ganglia to ethanol, which is proved to be not correct by this study as previously mentioned. To interrupt the neural networks of the celiac plexus, chemical ablation is preferred to other mechanical modalities. Ethanol or phenol used as nerve destructive materials and lidocaine as a local anesthetic has been used for CPN in patients with cancer. Phenol has the advantage of being painless with a similar effectiveness; however, it is highly viscid and has a short duration of block. On the contrary, ethanol has a longer duration of block but is more painful, so it is recommended to inject 5–10 ml of a local anesthetic solution before ethanol injection . A volume of 20–50 ml of ethanol 50–100% in concentration is the most commonly used neurolytic agent in clinical practice . In this study, CT-guided CPN was done by injection of 15–30 ml of 90% ethanol. There was good pain relief for 3 months for all patients. Bhatnagar et al. performed CPN for 20 patients by 15–20 ml of 50% ethanol injected bilaterally. 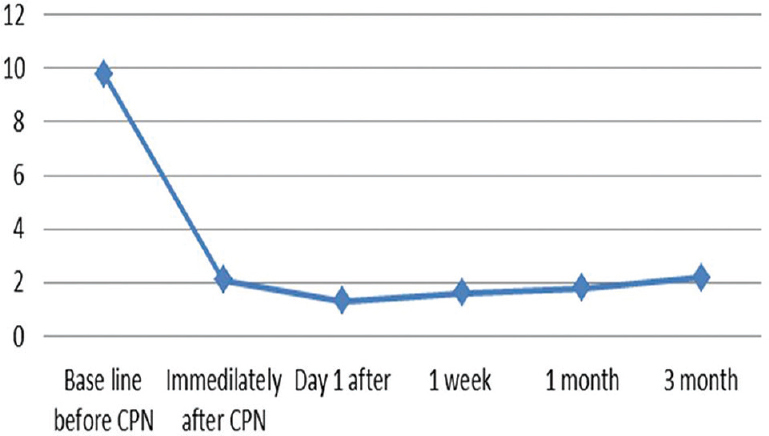 They reported successful CPN for all patients with notable pain relief for 2 months. However, Marcy et al. performed celiac plexus block (30 ml ethanol 99%) and showed pain relief obtained in 79% of the patients, which is less than our results. Tadros and Elia  in their study done on 21 adult patients with upper abdominal cancer pain using 50% ethanol obtained a significant decrease in the pain VAS scores in the first day following CPN with relatively stationary course for 3 months in all their patients. Regarding the degree of pain relief, our patients experienced significant decrease in their VAS score and opioid consumption. All patients exhibited a decrease in their VAS scores at all measured time points from first day till 3 months after CPN. Prior block VAS score was 9.1 ± 0.85. One day after CPN, pain severity decreased markedly to 1.3 ± 0.71. Three months later, pain severity still decreased significantly to 2.3 ± 1.02. This decrease in pain severity after CPN resulted in a high significant statistical difference (P < 0.001). These are similar to Bhatnagar et al. results who reported that the VAS score before CPN was 9.10 ± 0.85. One day after CPN, VAS score markedly decreased to 1.2 ± 1.02. Two months after CPN, pain scores had decreased to 2.10 ± 0.79 (P < 0.001). Mohamed et al. also performed CT-guided CPN and reported preblock VAS score at 9.82 ± 2.15, which decreased sharply to 0.82 ± 0.39 after neurolysis and was 1.73 ± 0.98 3 months later. The CPN is a safe and cost-effective approach to treat severe visceral pain associated with cancers specially advanced ones . The complications from CPN are believed to be due to interruptions of the autonomic nervous system owing to ablation of the celiac plexus and sympathetic blockage leading to unopposed parasympathetic activity . Similar to previous studies ,, we did not experience major adverse effects; they were all mild and transient. In our study, approximately 75% of patients witnessed transient diarrhea, only 15% had postural hypotension, and 60% had local irritant pain from ethanol. All of them relieved on simple medical treatment and did not affect the patients' life. Furthermore, we did not experience post-CPN neurologic complications in any of the patients, as we used the anterior approach technique, so the needle tip is away from the nerve roots and spinal cord, which makes these complications much less common. However, there are a few studies such as Teixeira et al. who performed the posterior approach and reported severe neurological complications in 1.35% in the form of permanent paraplegia. Fortunately our study lets us exhibit the efficacy of CPN on intractable abdominal pain caused by different malignancies either originated from the abdominal organs or metastasized from outside the abdomen, with a technical success rate of 100%. This is also in agreement with the study done by Tadros and Elia et al. who performed US-guided CPN for intractable pain from upper abdominal malignancies on 21 patients with pain relief in all patients but technical success rate was encountered in 20 (95.2%) patients and failure in one (4.8%) patient owing to colonic gas distension, which made the ultrasound-guided technique even more difficult. However, this problem was not seen in our study as the CT guidance provided excellent anatomical view and landmark not affected by such problems. CT-guided CPN is an easy and safe procedure that provides high success rates in alleviating pain and decreasing analgesics dose in patients with abdominal cancer, who usually experience severe pain. Rana M, Candido K, Raja O, Knezevic N. Celiac plexus block in the management of chronic abdominal pain. Curr Pain Headache Rep 2014; 18:394–398. Polati E, Luzzani A, Schweiger V, Finco G, Ischia S. The role of neurolytic celiac plexus block in the treatment of pancreatic cancer pain. Transplant Proc 2008; 40:1200–1204. Arai YP, Morimoto A, Sakurai H. The effect of celiac plexus block on heart rate variability. J Anesth 2013; 27:62–65. Narouze SN, Gruber H. Ultrasound-guided celiac plexus block and neurolysis. In: Narouze S, editor. Atlas of ultrasound-guided procedures in interventional pain management. 1st ed. New York, NY: Springer; 2011. 199–206. Kambadakone A, Thabet A, Gervais D, Mueller PR, Arellano RS. CT-guided celiac plexus neurolysis. A review of anatomy, indications, technique & tips for successful treatment. Radiographics 2011; 31:1599–1621. Wang H, Kohno T, Amaya F. Bradykinin produces pain hypersensitivity by potentiation spinal cord glutamatergic synaptic transmission. J Neurosci 2005; 25:7986–7992. Blinderman C. Management of cancer pain: optimal pharmacotherapy and the role of interventions. In: Russell P, editor. Advances in pain management. New York, NY: Remedica; 2008. 122. Souguir A, Hammami A, Kadri KH, Ben Mansour I, Jaziri H, Zayene A, et al. CT-guided celiac plexus neurolysis in the management of pain related to unresectable pancreatic cancer: about 2 cases. Open J Gastroenterol 2015; 5:37–41. Kappis M. Experiences with local anesthesia in abdominal surgery. Vehr Dtsch Gesellsch Chir 1914; 43:87–89. Eisenberg E, Carr DB, Chalmers TC. Neurolytic celiac plexus block for treatment of cancer pain: a meta-analysis. Anesth Analg 1995; 80:290–295. Bahn B, Erdek M. Celiac plexus block and neurolysis for pancreatic cancer. Curr Pain Headache Rep 2013; 17:310–316. Eichenberger U, Greher M, Curatolo M. Ultrasound in interventional pain management. Tech Reg Anesth Pain Manag 2004; 8:171–178. Bhatnagar S, Gupta D, Seema M, Thulkar S, Chauhan H. Bedside ultrasound-guided celiac plexus neurolysis with bilateral paramedian needle entry technique can be an effective pain control technique in advanced upper abdominal cancer pain. J Palliat Med 2008; 11:1195–1199. Mohamed A, Rania E, Hazem M. Computed tomography-guided celiac plexus neurolysis for intractable pain of unresectable pancreatic cancer. Egypt J Radiol Nucl Med 2017; 48:627–637. Seicean A, Cainap C, Gulei I, Tantau M, Seicean R. Pain palliation by endoscopic ultrasound-guided celiac plexus neurolysis in patients with unresectable pancreatic cancer. J Gastrointestin Liver Dis 2013; 22:59–64. Abloodu MC, Pujari VS, Channasandra TA, Bevinaguddaiah Y. Anterior approach celiac plexus neurolysis for a patient with necrotising fasciitis of the back. Nitte Univ J Health Sci 2015; 5:63–65. Tadros MY, Elia RZ. Percutaneous ultrasound-guided celiac plexus neurolysis in advanced upper abdominal cancer pain. Egypt J Radiol Nucl Med 2015; 46:993–998. Wyse JM, Chen YI, Sahai AV. Celiac plexus neurolysis in the management of unresectable pancreatic cancer: when and how? World J Gastroenterol 2014; 20:2186–2192. Titton RL, Lucey BC, Gervais DA, Boland GW, Mueller PR. Celiac plexus block: a palliative tool underused by radiologists. AJR Am J Roentgenol 2002; 179:633–636. Bhatnagar S, Khanna S, Roshni S, Goyal GN, Mishra S, Rana SP, et al. Early ultrasound-guided neurolysis for pain management in gastrointestinal and pelvic malignancies: an observational study in a Tertiary Care Center of Urban India. Pain Pract 2012; 12:23–32. Marcy P, Magné N, Descamps B. Coeliac plexus block: utility of the anterior approach and the real time colour ultrasound guidance in cancer patient. Eur J Surg Oncol 2001; 27:746–749. Levy MJ, Topazian MD, Wiersema MJ, Clain JE, Rajan E, Wang KK, et al. Initial evaluation of the efficacy and safety of endoscopic ultrasound-guided direct ganglia neurolysis and block. Am J Gastroenterol 2008; 103:98–103. Teixeira MJ, Neto ER, Marinho da Nóbrega JC, dos Ângelos DC, San Martin M, Assumpção de Monaco B, et al. Celiac plexus neurolysis for the treatment of upper abdominal cancer pain. Neuropsychiatr Dis Treat 2013; 9:1209–1212.